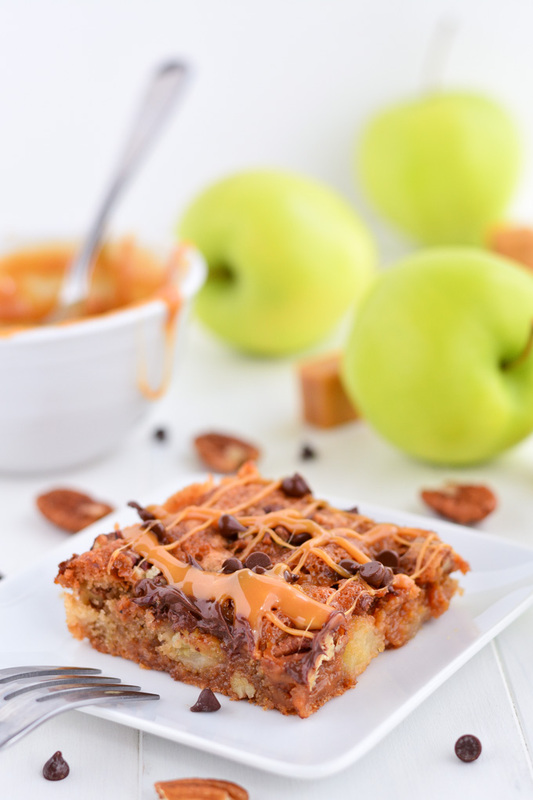 I am so excited to continue our November Apple Series with Melanie from Garnish and Glaze. 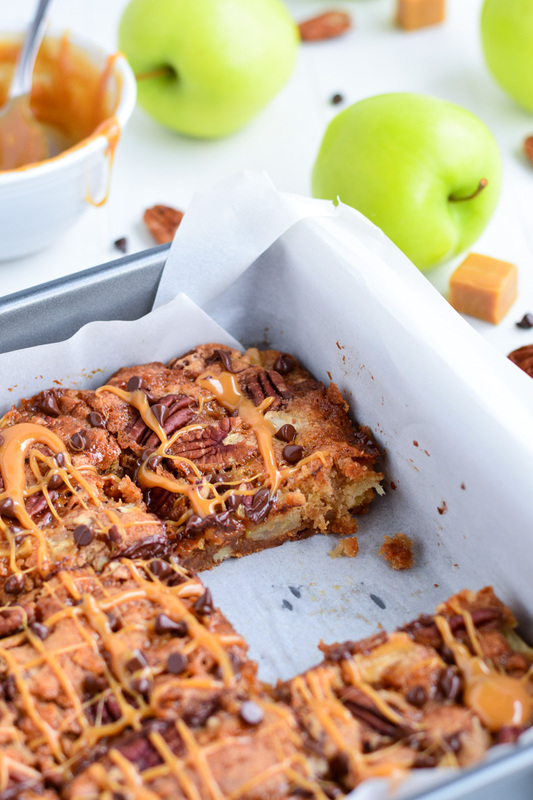 She is one of my FAVORITE food bloggers and is constantly making me drool with her photos. 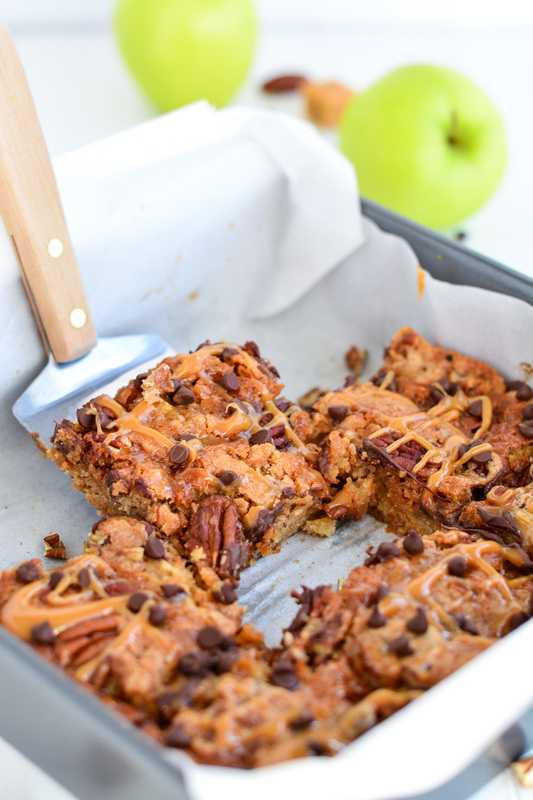 I mean, seriously, look at these Caramel Apple Blondies!! You will definitely want to follow along with her blog and can find her here on Facebook! I do love a good caramel apple but sometimes it can be a little tricky to eat. The caramel is usually a little hard making it difficult to bite and puts you at risk for having an extra visit from the tooth fairy. Well there is no need to fear the tooth fairy with these soft and gooey Caramel Apple Blondies. The caramel in the brownie and on top (yeah, double caramel!) is mixed with whipping cream to make the caramel softer. Plus, it’s extra soft when you eat this warm, which I highly recommend. I don’t think you’ll have a problem with that though. 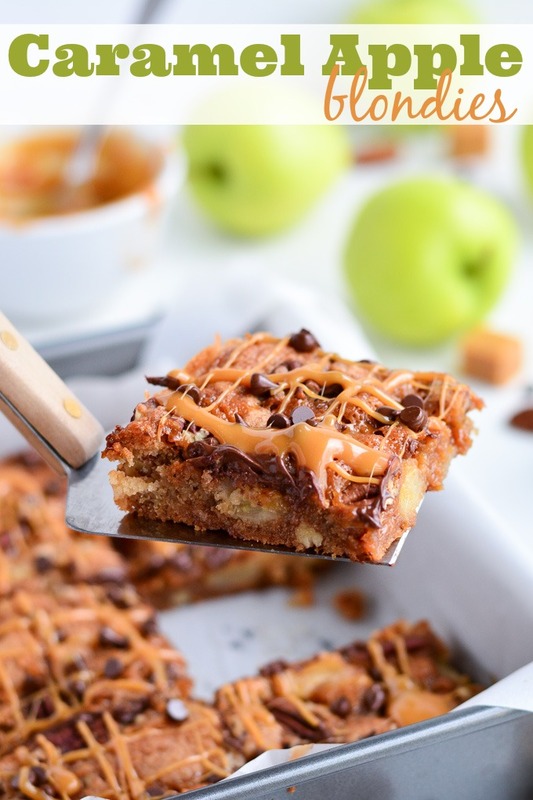 So just like your average state fair caramel apple, these blondies have apples (duh), caramel (double. remember? ), pecans, and chocolate. Oh baby! All of this mixed throughout a soft, moist, rich, gooey blond brownie. Yep! It’s a dream come true. Would you look at that goo!? Okay, I cave. I had to really practice self-control while photographing these. 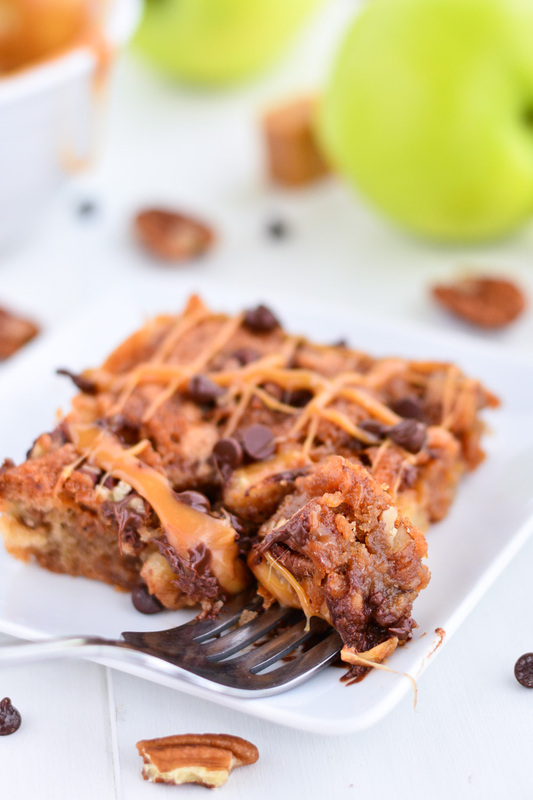 The smell of the brownie and cooked apples along with warm caramel and that melty chocolate… just talking about it makes my mouth water! I bet these would be amazing with a scoop of ice cream on top! But so good and addicting just on their own. Preheat oven to 350 degrees F. Line a 9x9 baking pan with parchment paper and grease with cooking spray or butter. In a large bowl, combine flour, cinnamon, nutmeg, salt, baking powder, and baking soda. In another bowl, beat butter, sugar, and vanilla together with an electric mixer. Add the egg and beat until creamy. Mix the dry ingredients in until just combined and then fold in the apples and the ⅓ cup chopped pecans with a wooden spoon or a spatula. Pour batter into pan. Microwave the 16 caramels with 2 tablespoons cream in 30 second increments, stirring in-between until it is melted and smooth. 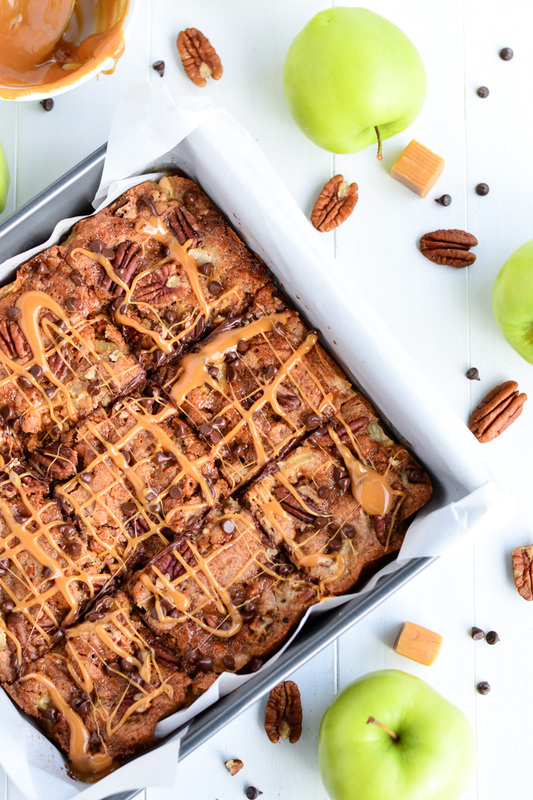 Drizzle over the batter and then sprinkle with the whole pecans. Bake for 35 minutes or until golden. Sprinkle the chocolate chips on top after pulling the brownies out of the oven. Let the brownies cool about 20 minutes and then melt the 7 caramels with 1 tablespoon cream and drizzle over the top. Cut and serve.